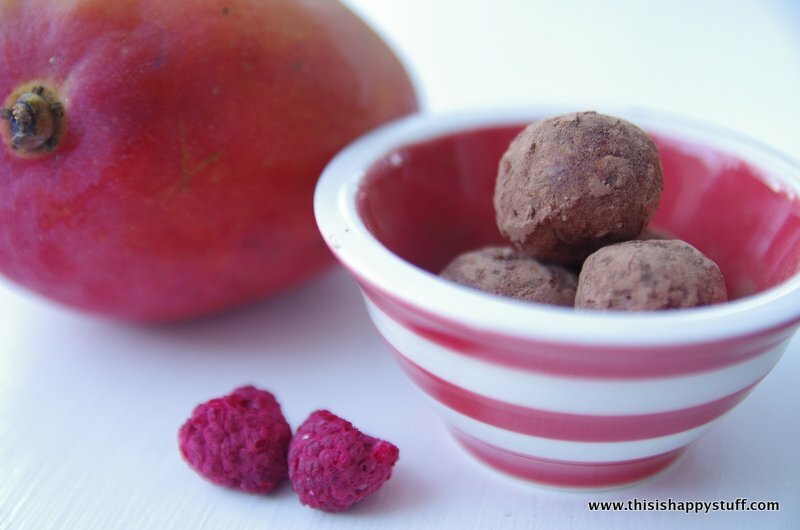 diy “larabars”: mango + raspberry, orange + cinnamon (and other yummy stuff) | happy stuff. happy new year! as a little gift to you, dear readers, i’ve created two original recipes similar to my beloved larabars. Here’s a quick tutorial for the “mango melba” flavor pictured above. The process is basically the same for both bars, so I’ll include two recipes at the end. 1. 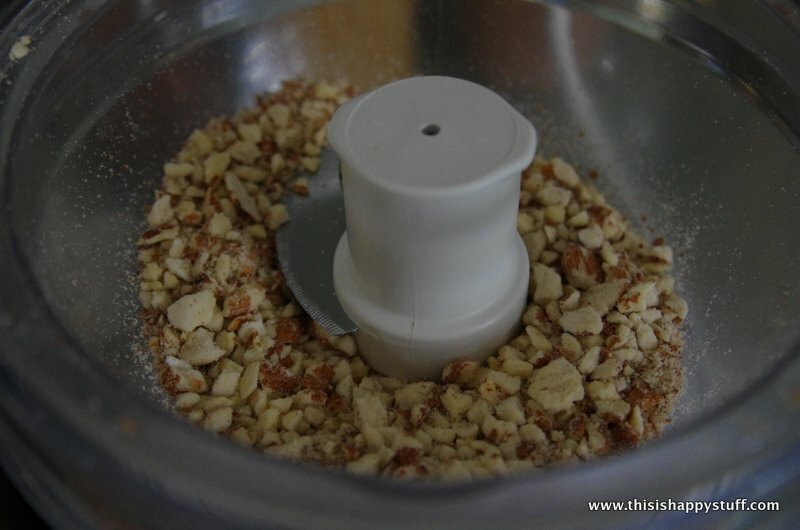 Chop the almonds in the food processor. You can make them a bit finer than what I’ve got pictured above, but don’t let them turn to almond butter. Remember–they’ll break down a bit more in the next steps. 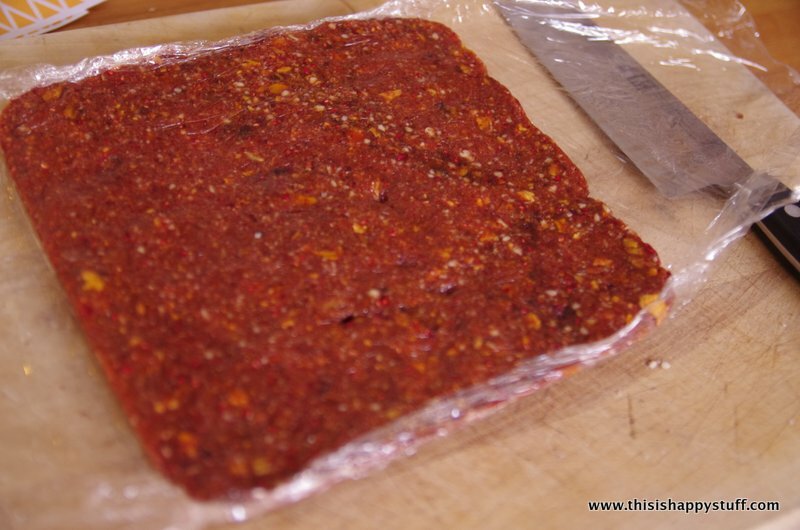 2. add dried mango and raspberries and process until they’re fairly small pieces (shown above before processing!). if your dried mango is extra dessicated like mine, you might try soaking it in some hot water for about 5 minutes before adding it to the food processor. 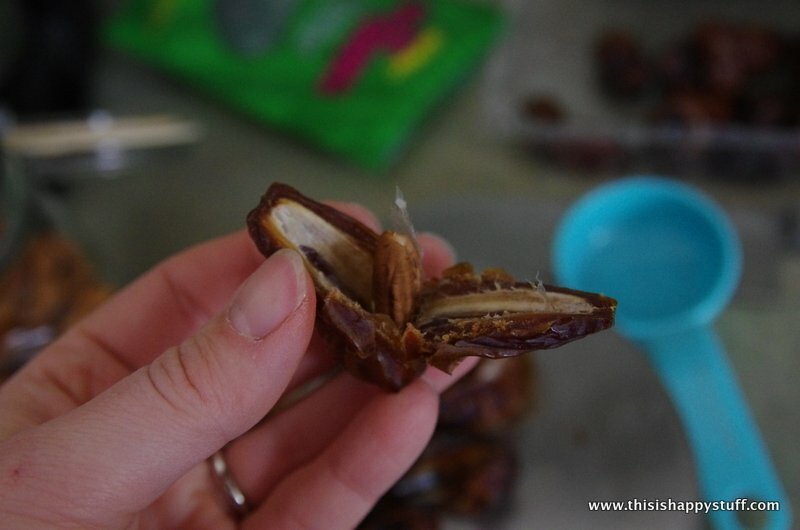 3. remove seeds from the dates if necessary (they come out surprisingly easy for such a sticky fruit!) and add the dates and the vanilla to the food processor. Pulse until the mixture is fairly fine. this is the trickiest part of the process because you’ll need to find a good balance between the wet and dry ingredients. the dried mango you’re using might be drier or more moist that what i had, so you may need to adjust quantities. if it’s too dry (flies around the inside of the bowl, not really getting more chopped and definitely not sticking together), add a date or two (or even just a tiny bit of water). if it’s too wet (sticks to the top of the food processor and you keep having to scrape it back down the blades), add more almonds. what you’re looking for is a mixture that will easily hold together if you squish some between your fingers, but that isn’t so sticky that it makes your hands messy to touch it. 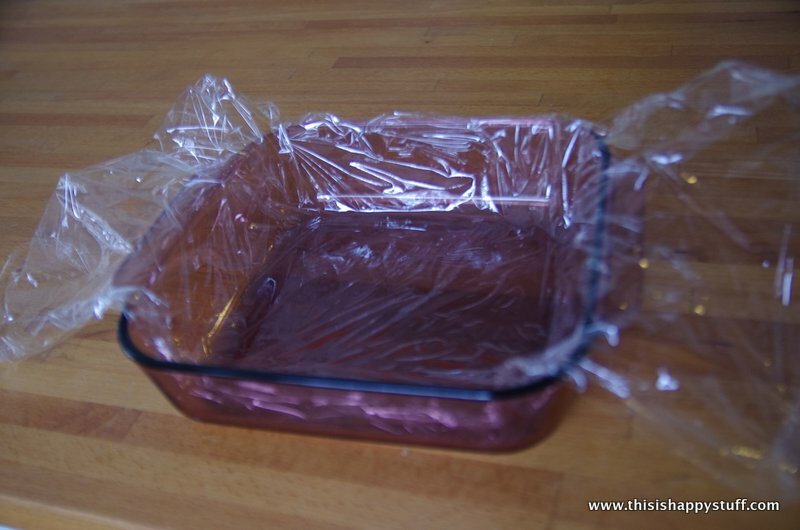 4. line a 9×9 baking pan with plastic wrap, leaving big “wings” hanging over the sides. 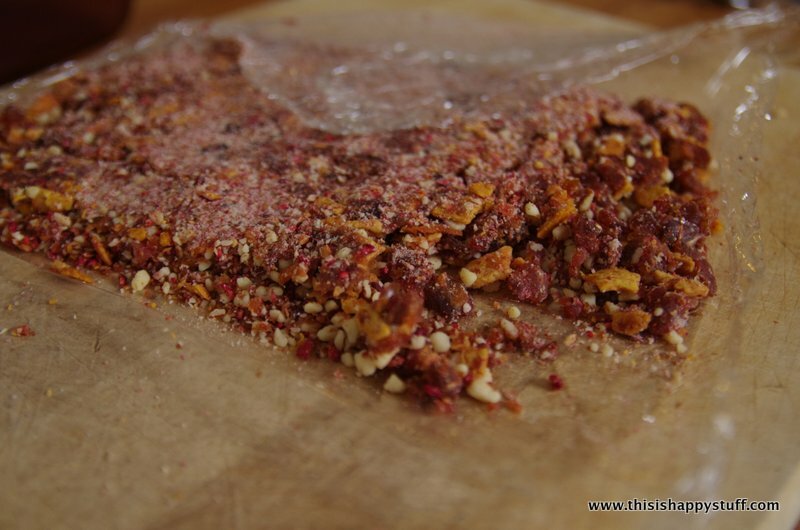 dump your mixture into the pan and press it flat, using the “wings” to press it down. when it’s about 1/2″ thick (or when you’ve got it squished all the way to the edges), cover it with the plastic wrap and put it in the refrigerator for a few hours to firm up. which looks uncannily like beef tartare. anyway… once you’ve got the bars a consistency that you like and once they’re chilled…. 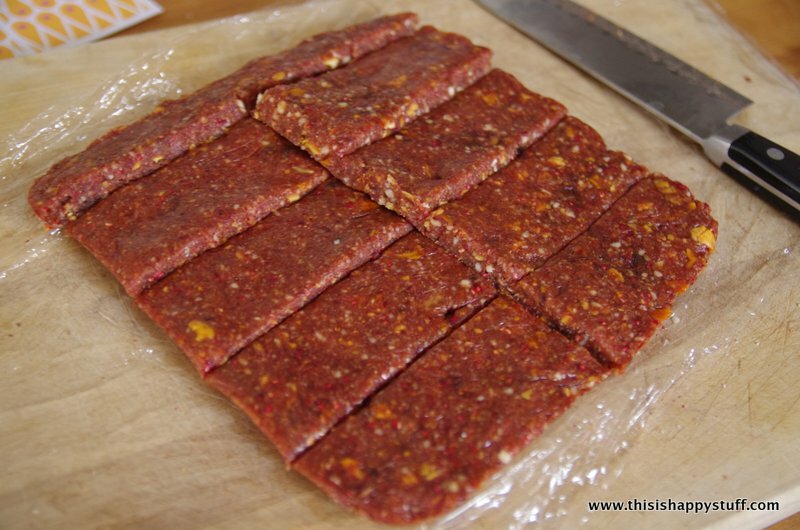 5. cut them into bars (whatever size you find convenient). see that tiny strip at the top? we’ll do something special with that in a minute. 6. wrap your bars in waxed paper, seal with tape (use washi tape if you’re feeling fancy!) 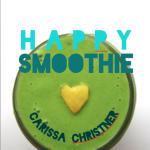 and if you’re giving them as a gift, add a wrapper (free downloads at the bottom of this post). they’ll keep in fridge or at room temperature for quite awhile, but mine usually get eaten pretty quickly. they’re great for lunchboxes, backpacks, diaper bags or to keep a few in your car (especially now when it’s cold. maybe not in the dead of summer.). now, back to that tiny strip of leftovers. 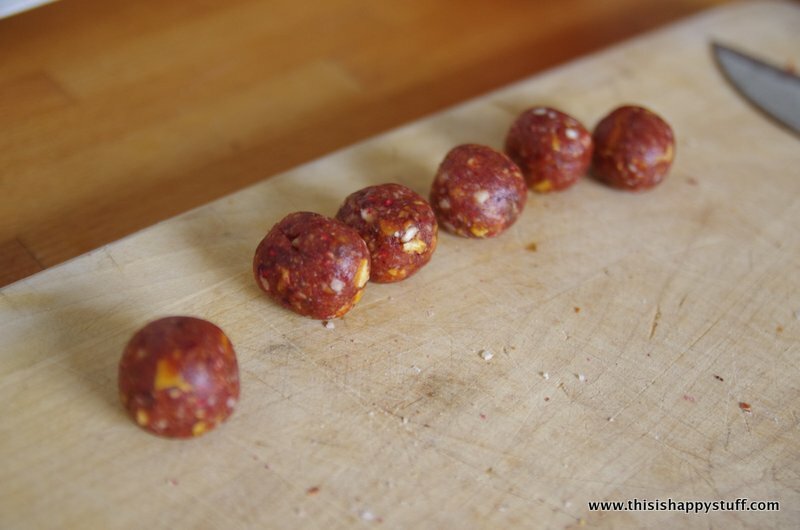 chop it into 1″ lengths and roll into balls. these would make great party snacks! to make them a little extra festive (but still “clean”!) roll them in raw cacao powder (i mixed mine with a little bit of powdered vanilla bean too). Line a 9×9 pan with plastic wrap, with enough hanging over the sides that you’ll be able to fold the edges in and cover the whole pan. 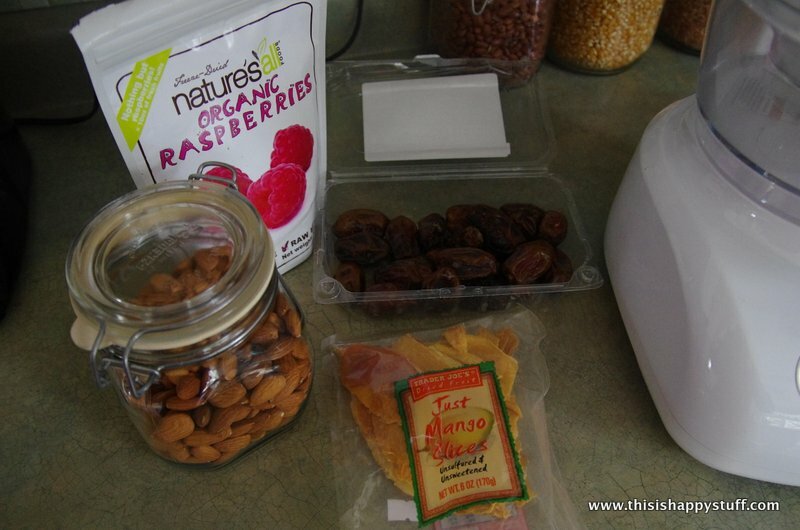 whir the almonds in a food processor until they are in small bits (not almond butter!). 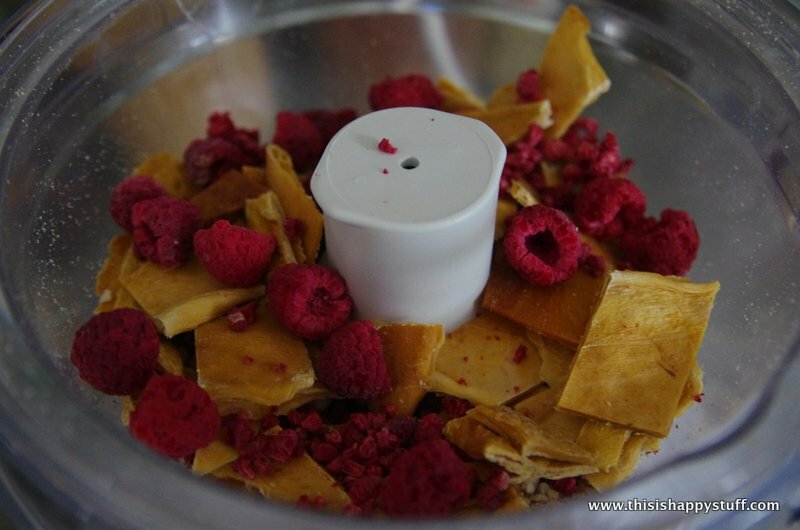 Add the mango, raspberries, dates and vanilla and whir until the bits are small enough that if you pinch them, they stick together. Dump the mixture into the 9×9 pan and (using those side flaps of plastic wrap) pack it firmly down. 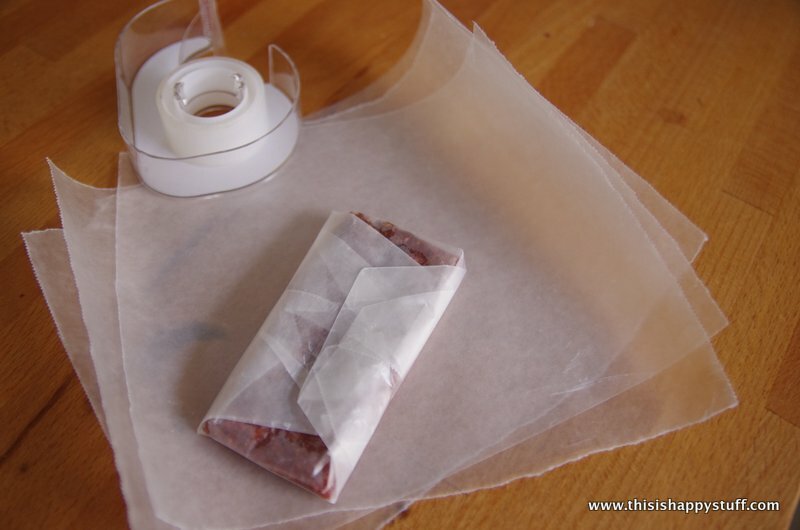 Refrigerate for at least a few hours, then cut into bars and wrap with waxed paper and washi tape. 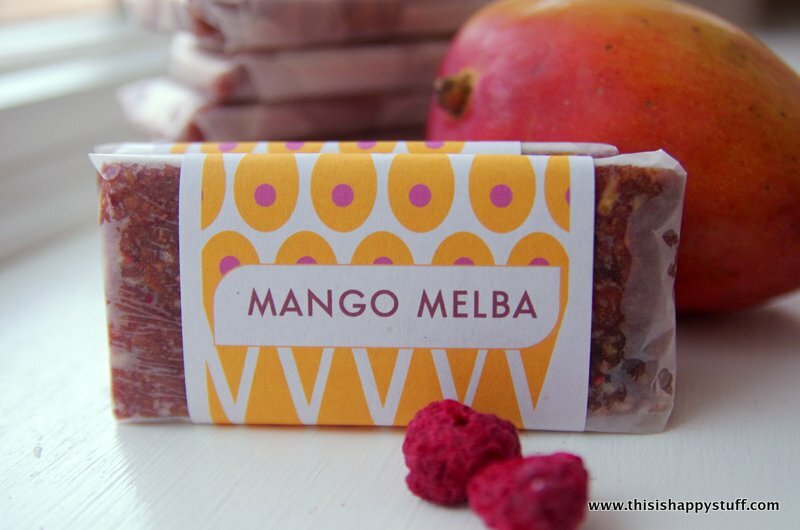 the instructions to make the bars are pretty much the same as for the mango melba bars. This entry was posted in clean, tutorials, yum. Bookmark the permalink. Theses look super tasty (and easy to make). Thanks for sharing! fava tea has hibiscus flowers! they currently have shops in appleton and greenfield and soon in brookfield. they’re also online. These look great! I’m perpetually looking for a good sugar-free granola bar recipe for my granola-bar loving husband. This one is worth a try! Thanks! Some of my favorite foods right here. All together. Can’t wait to try the recipe. Thanks for sharing! Hello! Stacy from LÄRABAR here…what a great post and what beautiful, delicious bars you made! I wanted to reach out to say Ä-mazing job! Our brand has always been dedicated to simplicity, so we love it when creative folks like yourself appreciate how simple our bars truly are. As a token of our admiration, we’d love to send you a little gift. If you are game, please email me your mailing address and phone number (FedEx requires both for delivery), and we will send some goodies your way.